For more photos of the High Line in New York City, visit www.thehighline.org/galleries/images/popular. Last June, I had the chance to spend three unencumbered days in New York City. Of course, being a landscape designer, I mapped out all the public gardens to visit and planned my daily route by train. Little did I realize that my trip would coincide with 90-degree temperatures. At the historic New York and Brooklyn botanic gardens, I baked in the heat and humidity, and the weather took my attention away as I focused mostly on the search for shade. Then, I visited the High Line. Granted, we beat the heat by visiting the High Line at 8am which certainly helped, but it was the only garden this visit that took my breath away. 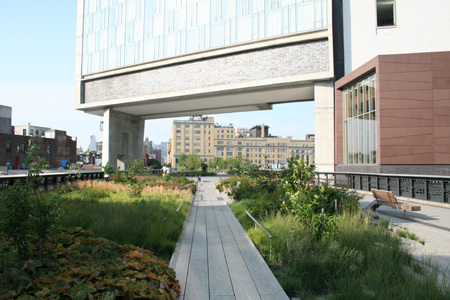 According to the Friends of the High Line website, the High Line was a massive public-private infrastructure project called the West Side Improvement originally built in the 1930s. It lifted freight traffic 30 feet in the air, removing dangerous trains from the streets of Manhattan's largest industrial district. No trains have run on the High Line since 1980 and in 1999, Friends of the High Line, a community-based non-profit group, formed when the historic structure was under threat of demolition. They worked with the City of New York to preserve and maintain the structure as an elevated public park. The project finally gained the City's support in 2002 and construction on the public landscape began in 2006. The first section, from Gansevoort Street to West 20th Street, opened June 9, 2009 and the second section, from West 20th Street to West 30th Street, is projected to open in the spring of 2011. 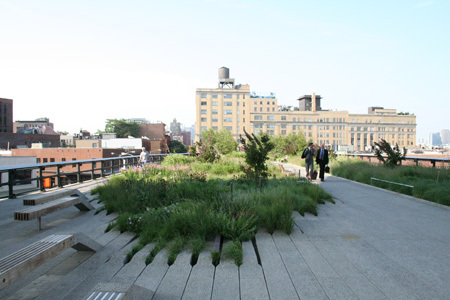 The High Line public garden, to me, represents what is best about city life – unique, creative and all-inclusive use of space. Floating above street traffic, the garden distracts you from the bustle of city while offering new vantage points from which to enjoy the view. The design of the garden is truly amazing – both functionally and aesthetically. Elements of the original structure and railway lines have been incorporated and are laid out in a manner that weaves you through the garden at a casual, meandering pace. They also give the space an important connection to the structure’s past. The plant selection has been tailored to the harsh conditions of the setting (windy, hot and dry) and seems to celebrates the wild, slightly overgrown look of the abandoned years of the rail line. But upon a closer look, it was evident that the plants were carefully chosen and placed. Throughout, I saw unique plant pairings and communities of native plants and their cultivars all used to their best advantage. And the wildlife…the garden was just teeming with insects and butterflies and birds. Of all the gardens I have had the pleasure of visiting, the High Line easily ranks in my top 10. I strongly recommend that you make it a destination for you and your family if you ever have the chance to visit New York City.